Instill confidence with a professional badges program. making sure to match your EXACT requirements. We offer unlimited templates designed for FREE. instilling the highest sense of security in your clients. InstantCard PVC plastic Photo ID cards are very difficult to falsify. since his/her photograph is on the front. been altered or falsified in any way. you may easily order cards for any of your employees. 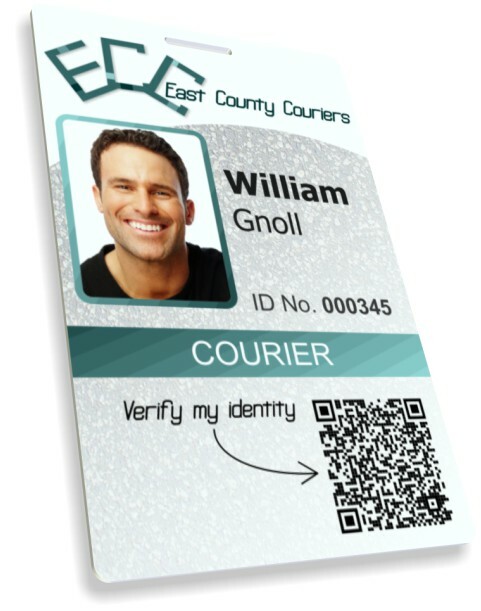 making ordering ID cards online as simple as possible. one-at-a-time, or in a bulk upload via a spreadsheet. Get your cards when you need them with same-day* shipping. was designed with single-card orders in mind. receive cards as soon as you have new hires! Nearly all transportation workers are expected to be able to provide valid company-issued credentials, in addition to their drivers license. Our professional ID cards are not just visually appealing, but they are highly durable. They stand up to the rigors of an outdoor job better than any laminated or paper-based ID card ever can. Print your IDs with barcodes , QR codes, or add a magnetic stripe in order to facilitate the logging of transactions. We have no minimum batch size. That means you may order just one or two cards at a time—at the same cost as all other cards. Our professional designers will create your free card template. You may then easily upload all employee information and photos. Ordering is quick and easy, using our custom web app. And, of course, all cards come with a money-back guarantee. With the increasing sophistication of travel services, more and more companies are in need of ID cards which serve for more than just a simple proof of identity. Our cards are frequently printed with one or more barcodes, or have a magnetic stripe, to facilitate the logging of transactions. An increasing number of transportation companies have begun utilizing QR codes to allow secure, immediate access to a driver’s credentials. InstantCard can provide you with additional information on any of these options. One of the primary purposes of a high-quality photo ID card is to reassure clients. Whether for delivery or taxi services, a badge immediately indicates to a client the qualifications of the person they’re dealing with. And it provides a name, taking some of the anonymity out of a potentially impersonal contact. InstantCard PVC plastic Photo ID cards are very difficult to falsify. As a result, when such a credential is checked, there is a very high degree of confidence that it does belong to the bearer, since his/her photograph is on the front. Since the printing is embedded in the card, and sealed in under a clear plastic coating, you can be sure that it has not been altered or falsified in any way. 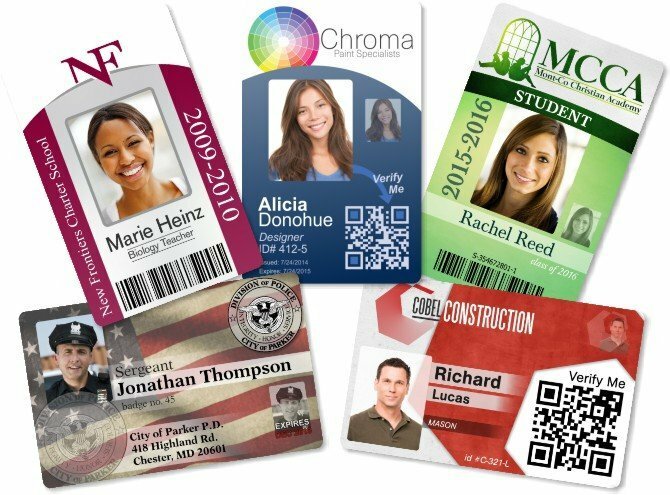 ID Badges are durable, secure, vibrant, & designed for FREE. Your employee ID Badges or membership cards will be produced and shipped out the very same day—Cards on demand, when you need them! We offer the fastest turn around in the industry, regardless of quantity. Our designers are standing by to get you started!